Most Bay Area property owners can appreciate an increase of their property value by using paving stones instead of concrete slabs. Pavers are stronger than concrete and are resistant to earthquakes. Additionally, paving stones are inexpensive to repair, which saves the home owner money in the long term. Paving stones are elegant and beautiful, and will enhance the beauty of any home. Interlocking Pavers Specialist is a family-owned business with over 25 years of experience. As Bay Area paving contractors, we are proud to serve the Silicon Valley, Santa Clara County, San Mateo County, Alameda County, Santa Cruz County, San Benito County and the Monterey County. We use our own crew for all of our paving installations. We provide a warranty for all of our materials and workmanship of the Hardscape installation as long as the original purchaser lives in the property. Interlocking Pavers Specialist has been creating artisan quality driveways and hardscape surfaces more more than 25 years. Our love of Quarry Stone and its ability to create beautiful and elegant outdoor home accents has helped us to build our successful family business. The driveway serves as the gateway to your home. The difference in curb appeal between a home with a cracked or stained concrete driveway, and one that is beautifully designed and laid out by an experienced driveway contractor is incomparable. If you are in the process of building a home, or have a damaged asphalt or concrete that needs to be repaired or replaced, consider the attractive and durable driveway surface provided by interlocking paving stones. 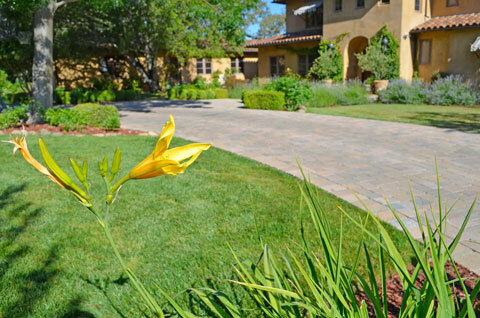 We’ve installed pavers for hundreds of Bay Area residents and here is what they are saying!